The Durbar Square is a marvel of Newar architecture. The Square floor is tiled with red bricks. There are many temples and idols in the area. The main temples are aligned opposite of the western face of the palace. The entrance of the temples faces east, towards the palace. There is also a bell situated in the alignment beside the main temples. The Square also holds old Newari residential houses. There are various other temples and structures in and around Patan Durbar Square built by the Newa People. The square was heavily damaged on 25 April 2015 baisakh 12 by a major earthquake. The history of the Durbar Square is not clear. Although the Malla Kings of Lalitpur are given credit for establishing the royal square, it is known that the site is an ancient crossroad. The Pradhanas who settled around the site before the Mallas have connections with the Durbar Square. Some chronicles hint that the history of Patan Thakuri Dynasty built a palace and made reforms to the locality but the evidence is minute. Scholars are certain that Patan was a prosperous city since ancient times. The Malla Kings did make important changes to the square. Most of the current architecture is from the 1600s, constructed during the reign of King Siddhinarasimha Malla and his son Srinivasa sukriti. Some of the notable Mallas Kings who improved the square include Purandarasimha, Sivasimha Malla and Yoganarendra Malla. Patan is one of the oldest known Buddhist cities. It is a center of both Hinduism and Buddhism with 136 bahals or courtyards and 55 major temples. Most of these structures are in the vicinity of the Durbar Square. 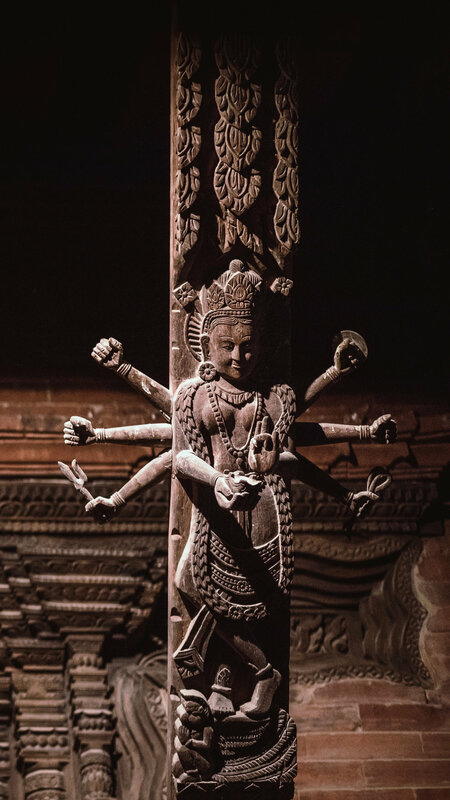 Krishna temple is the most important temple in Patan Durbar Square. It is built in the Shikhara style imported from India although it is unique in its own way. The stone carvings along the beam above the first and second-floor pillar are most notable. The first floor pillar carvings narrate the events of the Mahabharata, while on the second floor there are visual carvings from Ramayana. The temple was built in 1637 by King Siddhi Narasimha Malla. It is said that one night the King saw the Lord Krishna and his consort Srimati Radha standing in front of the royal palace. He ordered a temple to be built on the same spot. There are 21 golden pinnacles in the temple. Below the pinnacles are 3 stories. The first floor holds the main shrine of Lord Krishna with shrines of Radha and Rukmini at each side. The second floor is dedicated to Lord Shiva and the third to Lokeshwor (Lord Buddha). The square is crowded with thousands of Hindu Pilgrims and devotees during Krishnastami. Ghanta Karna (also called Ghanta Karna Chaturdasi and GhantaKarna) is a Newari festival celebrating the defeat of the mythical demon Ghanta-karna ("bell-ears") or "Gatha-Mungal" in local Newari language. According to the myth, the demon wore bell earrings in order to drown out the name of the god Shiva with their jingling. Attributed to him are acts of robbery, murder, and kidnapping of children. The festival is probably a relic of ancient demonolatry in the Kathmandu valley. The festival takes place during the month of Shrawan. This festival is celebrated generally in the month of June/July. This year it is on August 12, 2015. People are worshipping and offering sacrifices to demons, serpents and other supernatural and natural elements like wind, water and fire since timei of inceptions to get rid of evil powers and the legendry demons. There is a belief in Nepal “there was a Demon named Ghantakarna, a legendry demon who spread havoc amongst the people. This festival is believed to be celebrated to remember the end of Ghantakarma. Dummies of the demons are erected at street crossroads. People place pots of cooked rice at such intersections for him. A man wearing black and blue paint all over his body goes about begging for money. At the end of the day, the dummy is dragged to the nearby river bank for disposal with the painted man sitting on it. !" People offer the dummy food and meat. On this day, people also wear metal rings called gathemangal ko aunthi. This Ring is believed to have the power to safeguard people from all ills and evil spirits. . Before nightfall, the locals hammer three legged nails onto the door lintels to scare away the ghosts. There are various legends and myths attached to the Ghanta Karna devil that is revered as well as feared. Children make dummies of ghantakarna is made of bamboo, branches of plants and dry maze plant. When somebody passes by the side of the effigy the children collect money from them in the name of Ghanta Karna. Anybody hesitates to give the money the children being to shout calling him the grandson of the demon -"see the grandson of Gathe Mangal coming!" This day marks the beginning of the one-month long Lakhe Naach. In the ancient time, when little water and violent storm brought illness due to diseases like digestive diseases, most common during the summer, people thought evil spirits were to be blamed. They believed, it to be because of the absence of the Nine Durgas, evil spirits were free to enter into the city to cause such troubles. Even though nobody knows when this festival was started, it has been mentioned to be celebrated in Lichhavi era in the history of Gopal Bansha. But there are many myths about this festival being celebrated in the middle age too. According to a folk lore, a demon called Ghantakarna with a pair of bells on his ears used to terrify people by killing them. He was called Ghanta (Bell) Karna (Ears) to identify him by his bells on the ear. When, all attempts to kill the demon were not successful. A clever frog however was successful in killing the demon by trapping him in a swamp when he was on his way to hunting. It is told that the day marks the celebration of Ghantakarna festival. That is the reason, people from newar communities worship frog on that day. 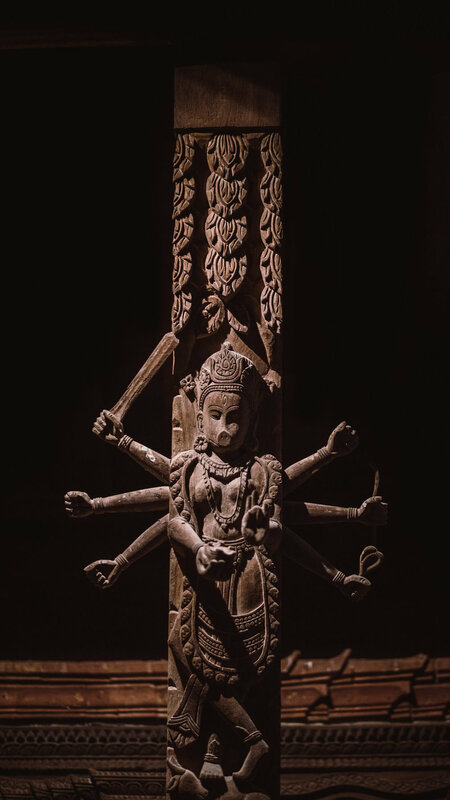 It is also controversial on whether Ghantakarna was a demon or a god as Hindu worship Ghatakarna as a devotee of Lord Shiva while in Buddhism he considered a symbol of god Bhairab.